Inside Film Online - Radius Should Be a Blast! K2 Films' director Helmut Kobler and producer Andrew Trapani were among the many prospective Internet filmmakers pitching their films at the Yahoo! Internet Life Online Film Festival. Billing their sci-fi film Radius as a "net film event," the duo have set up a website (www.makingofmovie.com) so that others may track the film's production on a daily basis via diaries, photos, and video and sound clips. From location scouting to editing, the film's progress is being documented by the director, the producer and other key team members. Trapani believes the popularity of movie DVDs allowing the viewer behind the scenes proves that there is a market for this information: "And not only is the site a marketing tool for our film, but a great opportunity for fans of the filmmaking process and for other filmmakers to benefit from our experience, since you learn so much on each film you make." They will prepare a weekly three-minute video that will run on their site as well as other sites which don't require exclusivity. "It's kind of 'The Helmut and Andy Show.' See two independent filmmakers put a film together," laughs Trapani. "People can visit our site and sign up for our newsletter." The 20-minute film, shot on 35mm then digitized to net video formats, will tell the story of a female pilot who crash lands on a planet behind enemy lines. She has 20 minutes to escape the blast radius of a ticking doomsday bomb activated by the crash.-- hence the title. After six years in the video game industry, Kobler prefers directing this action piece, rather than an art film. 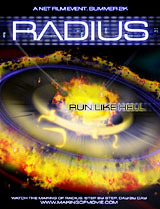 "The ticking bomb, the high-end special effects, the many plot twists make Radius unique among net films." Planned for distribution exclusively on the Internet.